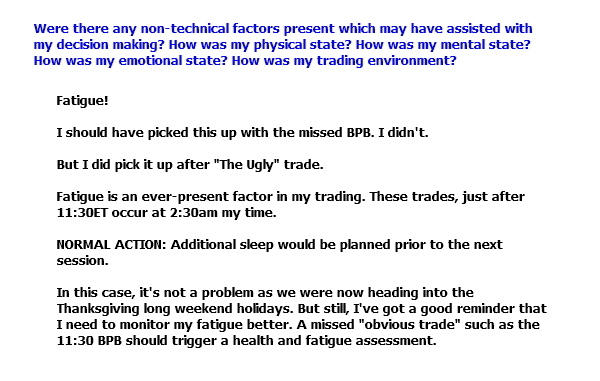 Last week we looked at a simple method for classifying trades based upon a post-session assessment as to (a) whether or not the trade idea did offer edge, and (b) how well we performed in managing the trade. Let's repeat the key points from that article (or click here to review it in full). 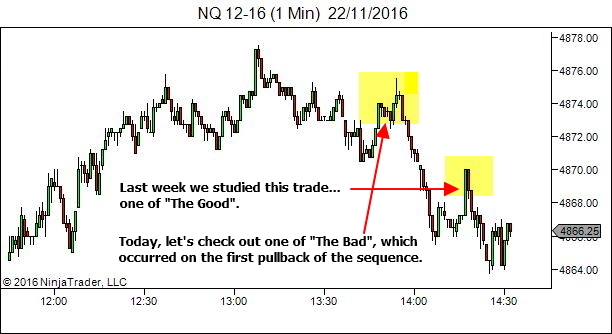 In last week's article we reviewed on trade which I classified as one of "The Good" (click here to see the trade review again). Now let's go on with one of "The Bad". So technically, we had a sideways trend and I should be looking only for opportunity LONG off the lower range support and SHORT off the upper range resistance. But here's where it gets a little more difficult. 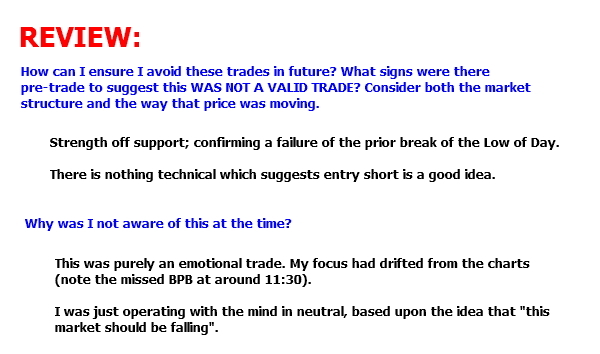 In discussing the trend definition, the YTC Price Action Trader talks about subjectively over-riding the trend definition when we sense it as being wrong. The fact is that all trend definitions break down at and around the points of transition from one trend-type to another. And often, you'll see (or feel) something that is not yet visible in the chart. I was sensing the rollover of price, transitioning from the sideways trend to a downtrend, effectively forming the rounded top that we saw earlier. So I pre-empted the change. Price is not yet showing a downtrend. But I'll be operating as if it was about to make that change. If I'm wrong, price will let me know. 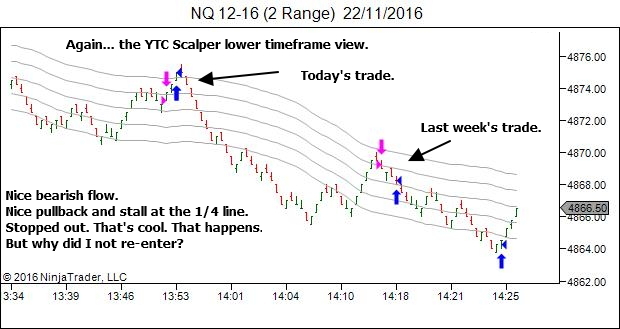 But if I'm right, I can get a nice and early entry into the new trending move. Let's review the definition for one of "The Bad". "Poorly managed" includes failure to re-enter. Let it go. Move on. There are more trades coming and they need my full attention! Trading is not a game of perfection. But rather a game of managing my imperfection, within an environment of uncertainty. So… just quickly… what about one of The Ugly trades? These are the ones that, with the benefit of hindsight, just have no edge. They're the ones that should never have been taken. The Bad and The Ugly… they happen. It's a part of trading. But while we accept that, we should always be striving for improvement in skill and expertise. Nice two posts, thank you so much!. 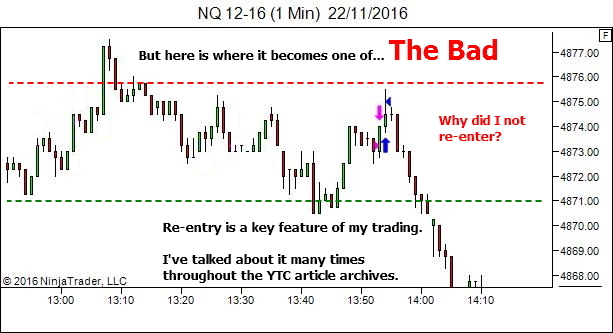 Definitely reassess the decision for a re-entry when i’m stopped out is a key point to me. I’ll do a little (big) work to improve it. Thanks Paul. I’m pleased you enjoyed this recent series of articles. But the real problem I face at that instant when the break of level happens is that I give up my original bias and get affected by the loss and cant think properly for some time even if the break is immedeatly rejected. So I guess I am thinking more of the loss that I just took and that gives rise to some self-doubt which doesnt allow me to look properly at the chart. I think one will get better in such things only with experience. 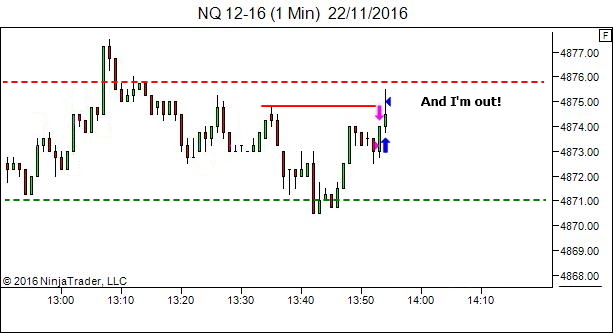 And one more point: If our premise is invalidated by the break of a level, and if that invalidation is immedeatly rejected, can we also call it a kind of trap for the traders against our bias? Yes, you’re 100% right that acceptance of loss does get easier with experience. Everyone says that they understand the probabilistic nature of this game, but their reactions to losses show that it’s not truly accepted. This does take a LONG time. 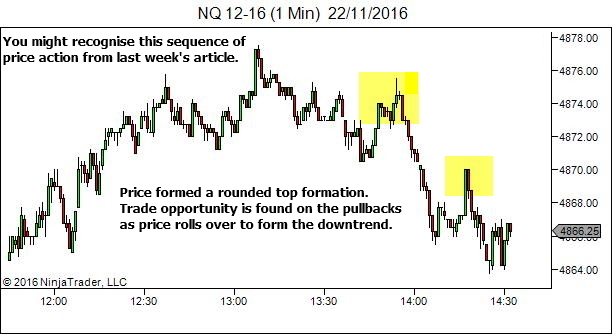 One key thing to consider though, which can speed up the process, is the fact that most traders are attempting to learn with too much risk. Are you able to cut position sizes? Will that help with acceptance of loss? Thanks once again for another great article. 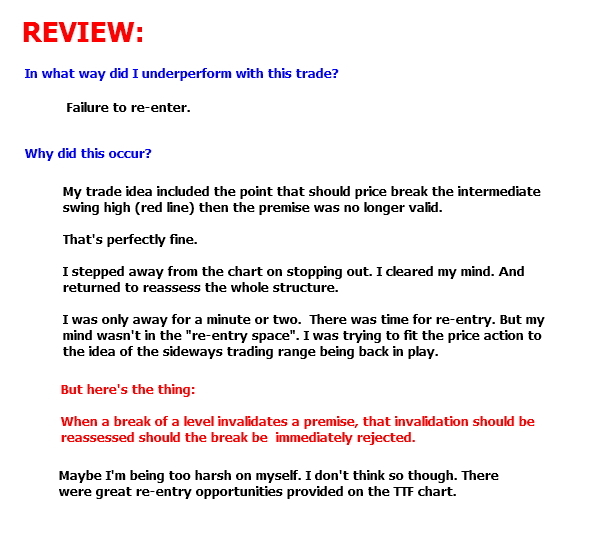 I am only half way reading your YTC price action books that I have purchased and while I am trading TST combine and reading your books simoultaneously, I have noticed one habbit in myself which is little difficult to break. 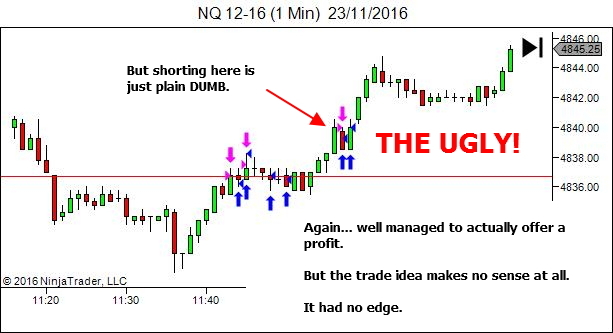 In one of your bad trades that you have mentioned, you got stopped out at a point where you regreted to not enter again. RIght at the point, If I am fully sure that price will come down, instead of stopping out I usually add one more position to sell. So now I end up averaging it out. 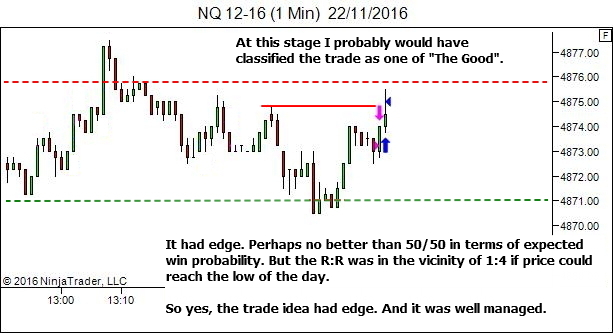 It is again risky because many times price does goes up further and then I need to manage it very aggressively to get out from the position. How do I break myself from this habbit ? 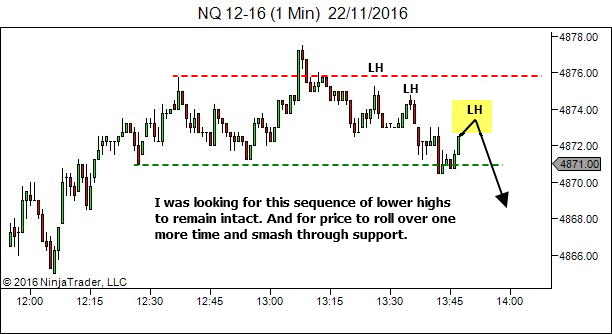 Many times it is rewarding and I am able to get out at breakeven or make some small profit. But its never easy for me to get stopped out it exactly the same setup that you have described specially when I am so sure that market will test that ( re-entery point ) before it comes down. I hope I was able to explain my problem. Would love your input on that. In the vast majority of cases it’s not a psychological issue, but rather one of the five problems listed in the first half of the article. Please take some time to consider whether one or more of these might apply to your situation. Otherwise, as stated in the remainder of the article – habits and state management. Maybe your problem is not as bad as the person who inspired that article, but it’s the same issue. A failure to accept losses as a normal part of this business. 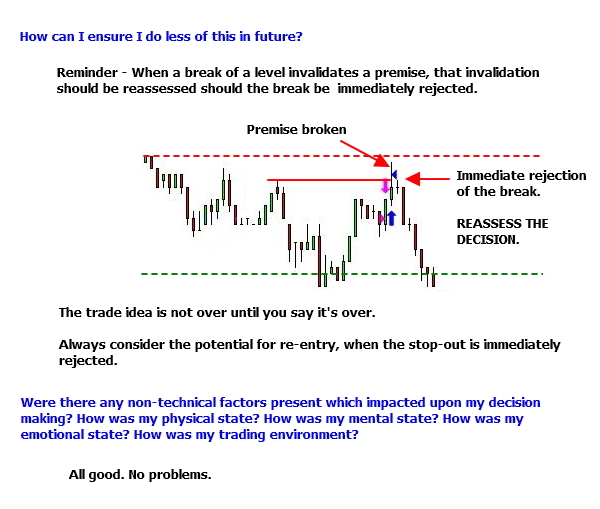 If you must fight to make that loss back, why not take the initial “smaller” loss and then stage the fight back at a better time and place, of your choosing, rather than right now when the market is moving in the wrong direction??? Thanks lance for all the pointers. Your guidance is invaluable and I am lucky to have you as my mentor . I promise the day I get funded with TST, I owe you a nice gift :). You’re very welcome! 🙂 I’m glad that I can be a part of your trading journey! Sorry for entering into the middle. But as a live trader with TST, let me say this. The combine rules are so tight and brutal which deviates a lot from the learning curve. If you are in the process of building the trade plan, I suggest you to stay away from the combines and work with your own money. We must have an A plan before attempting the TST combines. Even then, it makes it tough. 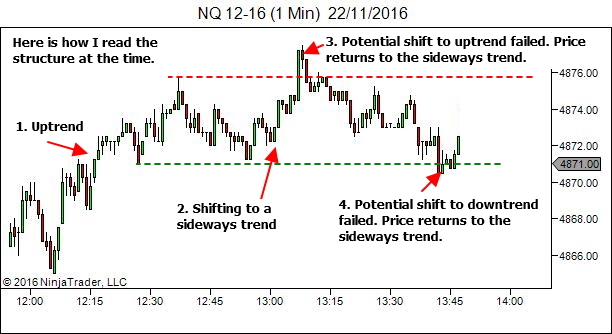 Trading combines during the learning curve and trying to complete it unconsciously adds a lot of bad trading habits which are harder to fix at later stages (I’ve been there). Thanks for your input. 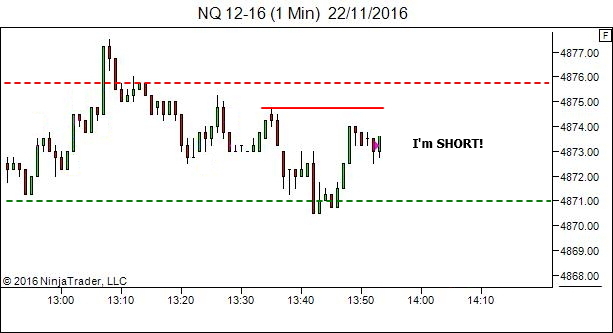 I agree that TST combine rules are tight and brutal but it still provides great platform for all the traders who are new in this arena. Infact, I would strictly advice any newbies to not use their own money untill they prove to themselves in growing account to a reasonable level . 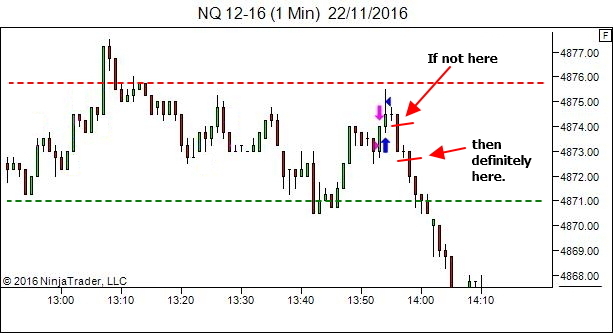 Trading combine can become less of a challenge given we follow Lance beggs knoweldge base for sure. Being aware of bad habbits and working on it is also a learning process. My goal is not to just win the combine but to do it in a right way. Trading is all about journey for me and not destination. I want the journey to be enjoyable and less painful :). But thanks a ton for your advice. Hi Lance, thank you for sharing such an interesting concept. I don’t get one case. 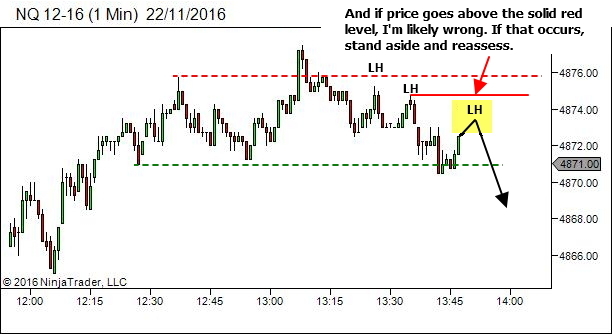 If you had a trade according your system (discipline is ok ) but the price moved in opposide direction initiating SL would you mark the trade as Good, Bad or Ugly? Hi Alex, That’s a good trade. 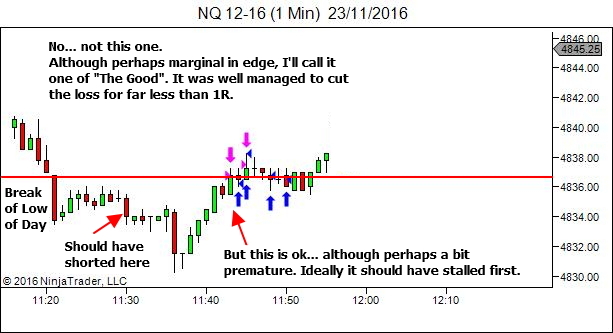 If it was a valid trade in accordance with your strategy, and the entry and subsequent trade management decisions were reasonable, it’s all good. Losses are part of the game.